Antonio Santin is a young sculptor born in Madrid in 1978, Bachelor of Fine Arts from the Universidad Complutense de Madrid and currently lives and works in Berlin. The title of the show “Carne de Kanone” is a wordgame, referring to flesh as to sacrifice or as the incarnation of lust. ANTONIO SANTIN. Naturaleza Muerta XXV. 2008. oil on canvas. 300x200cm. His hyperrealistic work emanates the aseptic smell of dead meat; the rawness of his carnivore landscapes reveal the lack of empathy in his gaze. Santins work is subject to the gaze of the beholder and his connotations. Thereby the artist steps away from any moralistic and accusatory discourse – his main object is to play with the different spheres of meaning that the human-animalistic materia evokes. Mixing together portrait and still life as his motif, he represents animal heads and flayed carcasses like human portraits; and human faces and female nudes which are filed with the toughness and the cold and objective firmness of a piece of meat. 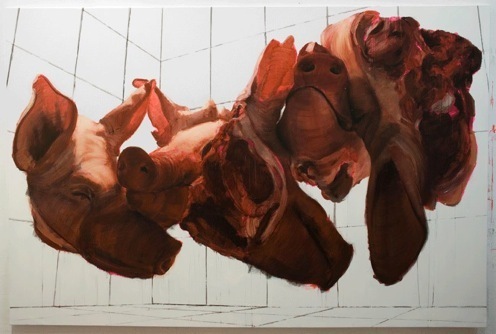 Spanish language does not distinguish, as other European languages, the edible meat and the human body, and the artist dedicated his work to this confussion, by giving to his paintings a volumetric appearance which is typical of a piece of meat, or why not, also a piece of sculpture. His technique is painting, and the motif comes directly from the slaughterhouse: it consists on a series of carcasses of dead animals that worried him when he was reading Animal Farm by George Orwell. 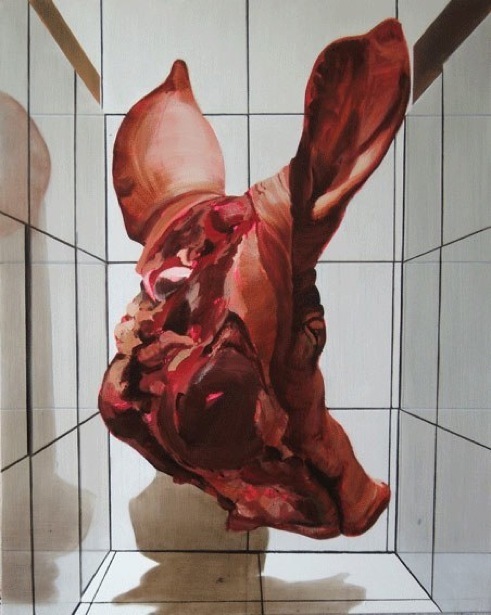 In his paintings, the pig’s head – one of Santíns favourite themes – is floating in an empty nuclear white space, with no references or leads that could distract the beholder from the bareness of the flesh, or that would make its sight more easy to digest.